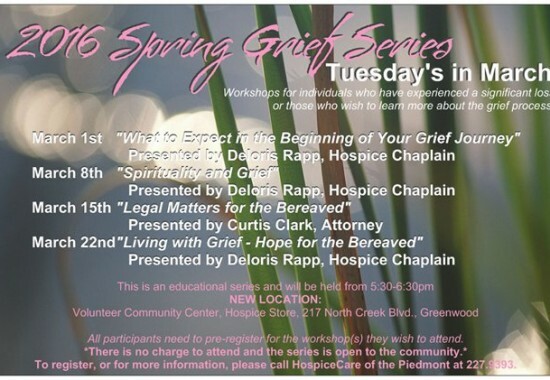 The workshop series will be held on Tuesdays, beginning March 1, 2016 from 5:30 p.m. until 6:30 p.m. at the Volunteer Community Center, Hospice Store, 217 North Creek Blvd., Greenwood. 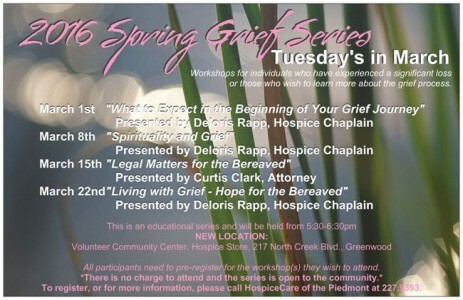 If you have had a loss and/or desire information regarding grief, you are invited to attend. There is no charge and the series is open to the community. Please call 227-9393 to register or for more information.